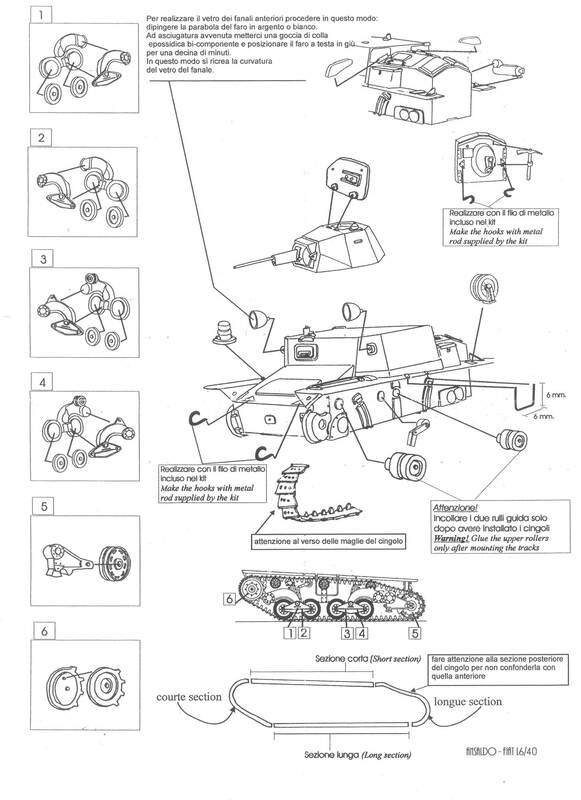 This reconnaissance tank was produced from 1941 to 1944. It was armed with a 20mm gun and an 8mm machine gun. 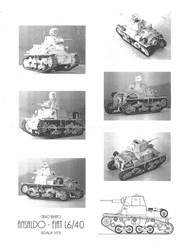 Some were converted to turretless ammunition carriers and some to self-propelled guns, called Semovente da 47/32. A flame-thrower version was called L6/40Lf. While it would seem that this light tank was of limited combat value in 1944, the Germans seized 106 of them after the Italian armistice and even decided to continue limited production on their own. They were mostly used on ant-partisan duties. 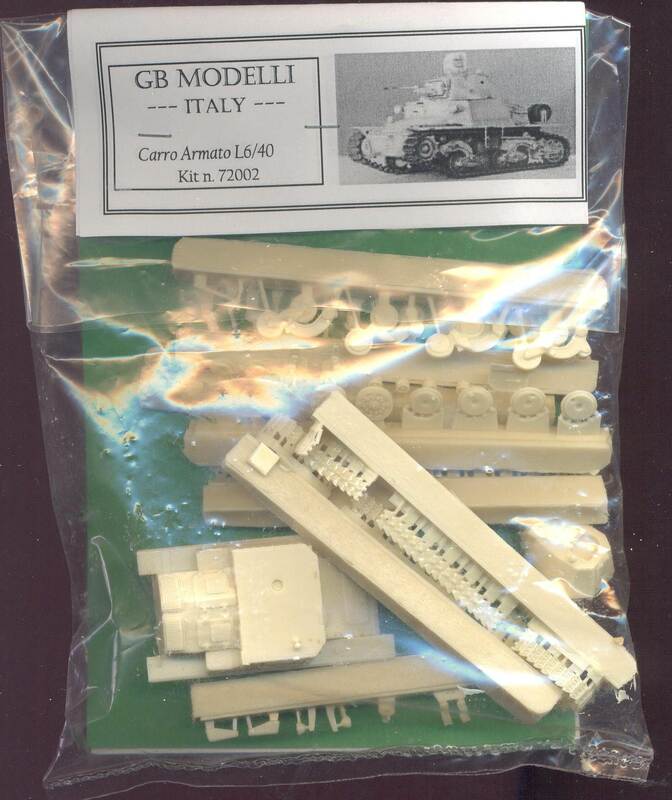 This kit was previously released under the Il Principe Nero label. Parts are nicely cast, with no warping. Pin holes were few; warping or other defects were not found, except on the tracks, which suffer from some uneven casting to the point that I feel it is necessary to put the tank in a diorama so I can slap some mud on them. The manual is in Italian, with only partial English (and French) translations. I started by removing the bigger pieces from the molding carrots, most of them with a motor tool. The motor tool ensures a clean cut, with less risk of a crack propagating towards the actual parts; it also ensures a lot of dust whirling around. The parts that required the most care were the sprockets as the teeth are easily damaged. Parts were then cleaned up with scalpel and sanding paper. The resin is very pleasant to work with: not too brittle, nor too flexible. Clean up is limited, by the way, with very little flash and minimal molding pegs. Five pin holes were found and filled in. Assembly was started with the bogies. 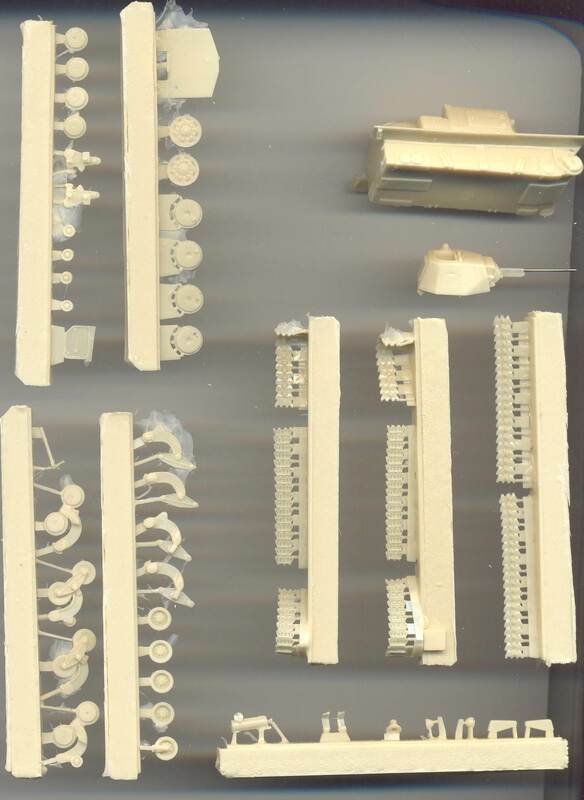 One half of each roadwheel is attached to the rear half of the bogie truck, the other half needs to glued to this part, after which you can install the face of the bogie truck. 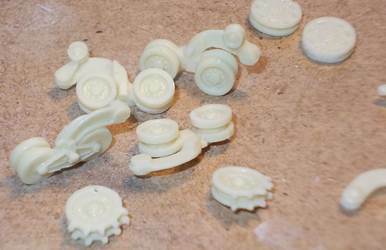 The wheel halves have no locating pegs, which makes it a bit more difficult to install them correctly, especially when working with fast drying superglue. Some wheels that are attached to the bogie are not perfectly aligned. The easiest way around this, was to allow for a certain amount of "toe-out" between the wheel halves. I figured the problem would not really show as long as the outer wheel halves were well-aligned. 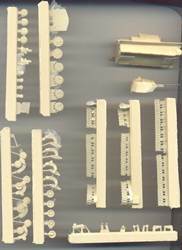 Keep more than half an eye on the bogie parts, as there are arms with and arms without return rollers, and you might easily mix them up. The drive-sprockets have locating pegs. 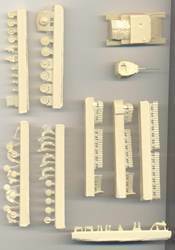 Be careful, though, as the pegs are installed in a way that only one of the outer halves will line up with a given inner half. It is quite obvious, when you pay attention. The resin tracks come as pre-assembled sections, four per side. I like this, as the thought of having to bend resin tracks by heating them has always scared me sheetless. The tracks are not too bad what the level of detail is concerned, but suffer from too many blemishes and aren't always perfectly pre-assembled straight. I found it easier to install the tracks by removing some teeth where the tracks met the rear idler. The hull is a single, solid piece, while the turret can accept a "half-figure" but is otherwise solid and cast integrally with the gun. Neither has any faults. A special feature of the kit is the choice of a metal rod for the gun tube. This has obvious advantages: it will always be perfectly straight and won't suffer from casting defects. It will also dramatically enhance the solidity of the gun, which might have been very brittle in resin. The minor inconvenience would be that the end cannot be drilled out. 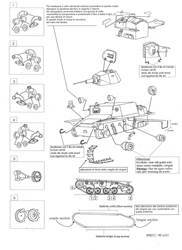 The manual mentions the use of metal rod to make a tow hook and foot steps. As I understand it, this metal rod should be included, but it wasn't. I used some brass rod I had lying around. It seems I have not positioned the front tow hooks correctly as they should be higher up the hull. I might also have missed a towing eye on the nose of the kit. At this point I compared the look of the kit with the limited references I had. Not having any scale drawings that I could truest for the full 100%, I mainly looked at pictures and compared them with the kit. It seems the look of the vehicle has been captured well. 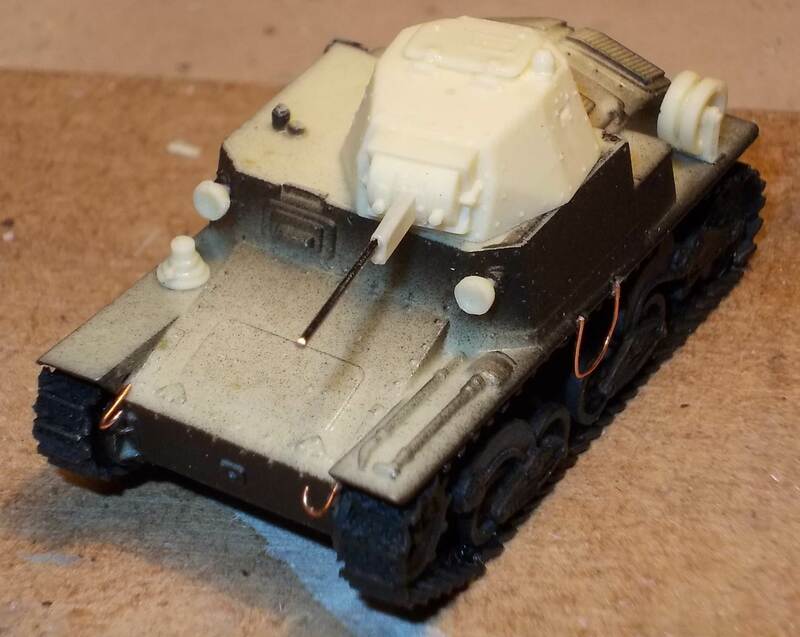 I chose to represent a German vehicle and painted it as such. It is difficult to tell from the pictures I have seen whether the return rollers had rubber tyres or not. 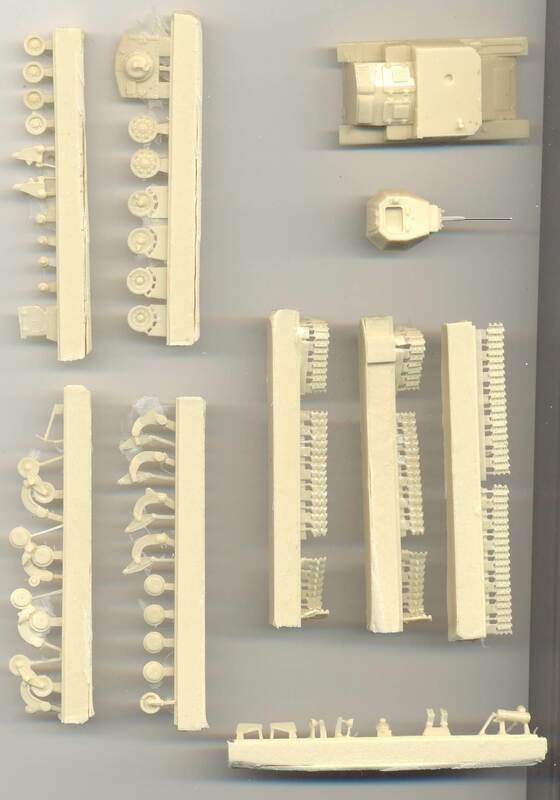 As the kit comes without decals, I dove into my spares box and used Balkenkreuze from an old 1/76 Fujimi PzKpfw38(t). The licence plates came from Decal Details MI-109, which incidentally also has Italian markings. For more info on L6/40s in German service visit http://beute.narod.ru/Beutepanzer/italy/tanks/L6-40/L6-40-1.htm and following pages. Thanks to Georgio Briga (GB Modelli) for the review sample.